The bonefish catch with Catch the Wave. Based in Blue Have Marina at Leeward on Providenciales, Catch the Wave offers custom fishing and tour charters to the best of the Turks and Caicos. Catch the Wave is headed by Edward Missick, who grew up the quiet island of North Caicos. His experience and knowledge of the shallows and sounds of the Caicos Islands has made him one of the best bonefisherman in the Turks and Caicos. Catch the Wave maintains a wide fleet of modern vessels, ranging from sleek bonefishing flats boats to an expansive 45 foot party catamaran. Discover secluded cays and spectacular beaches on a custom boat charter. Explore vibrant snorkelling reefs, see the friendly Turks and Caicos Rock Iguana, or simply relax on a perfect beach. Glow worm tours are available during the full moon as well, and offer a fascinating display electrifying light. Charters include refreshments and rum punch. 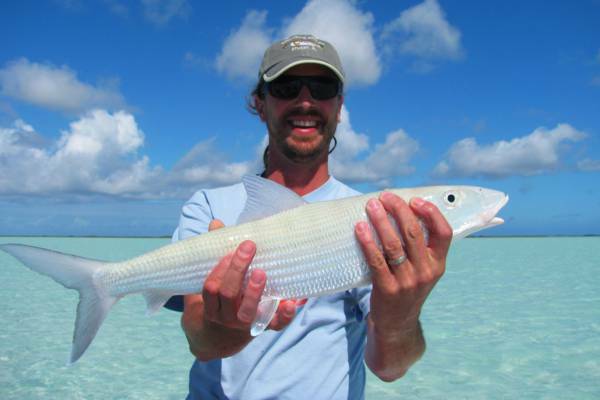 The Caicos Banks are an incredible collection of crystal-clear water, shallow flats, and mangrove channels, and there’s no better guide to this excellent bonefishing environment than Edward Missick. Reef or bottom fishing is an exciting activity that perfect for all ages. The catch can include several types of snapper and grouper, jacks, barracuda, and more. Many restaurants are happy to prepare the fish, and the resulting dinner will likely be the best meal of your vacation! If you’d like to try your hand at hooking big game fish, the deep and pristine blue of the open ocean is only minutes from Providenciales. Marlin, tuna, wahoo, mahi-mahi, mackerel, and sailfish are waiting. Last reviewed by an editor on 12 July 2018.